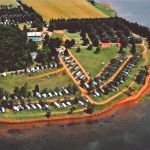 Ask fellow campers about "Cornwall / Charlottetown KOA" and nearby attractions. Big Big rig friendly. We had a prime spot overlooking the bay. Beautiful, definitely a do again. 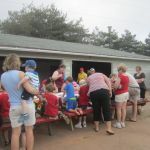 Lots of things for the kids to do, We camped at Cornwall / Charlottetown KOA in a Motorhome. Jammed up against other RVs with ancient electrical and sewer connections this RV park is showing its age. Sewer was located under a tree with a board over the sewer hole. The electric circuit breaker was difficult to find located on the next site over. Lots of activities for kids, typical KOA. WiFi, 3 OTA TV channels, no cable. Verizon cell service marginal 3 bars. Limited 50 Amp service available, I didn't see any big rigs, but the place is huge. We camped at Cornwall / Charlottetown KOA in a Fifth Wheel. As we made faster time than expected travelling to PEI, we stopped at the PEI Visitor Center to inquire about campsites for the night, as our reservations at PEI Nat'l Park only stated the next day. They suggested KOS Cornwall. Lady at Visitor center initiated the call, said she was calling from the Visitor center to see if they had availability. Phone was the handed to me. I say "hello", KOA goes "we have a site for you". I go "o...k..., but you don't know what kind of RV I have". He goes "we have many sites". I then tell him I have a 23-feet travel trailer with a slide-out, I don't really need sewer, but I need electric 30-amp, water and I would like not to have to disconnect rv from truck. He says it's fine, to give him my credit card number for payment. At this point, I'm a little concerned about their customer service. We get there, walk-in the office, looks like Boxing Day at Walmart. Tons of people, no indications where to sign in. Finally manage to "talk" to a staff member. Guy never looks up, says "name", proceeds to draw map to where our site is, hands me over the receipt, gets up and leaves. Driving to our site, it becomes clear we're in the tents area. We get to our site, no sewer (ok with me), 15-amp electrical, 1 water tap for 2 sites. It's technically a pull-through, since you can park a car and a tent at each end of the site. Somehow manage to "pull through" after avoiding cemented fire pit, car from other site. Front of my truck was sticking out about 8 feet in the road, so I have to disconnect. Neighbor "kindly" tells me he was there first so he gets the water tap. Drive back to office, after 20 minutes manage to explain the situation to staff. She just looks at me and says: "at least you have a site. If you're not happy, leave". By then, it's 10:30pm and my 5 children are sleeping in the car. Decided to stay. Next morning had to ask front neighbor to move his vehicle so I could pull out. I realize we were there during peak season, and we had no prior reservations. Therefore, I can live with the limitations this creates. However, they did say it would be fine, but it turns out it wasn't. They completely ignored what I asked (probably didn't even listen). They run a campground, you'd think they know the difference between 15-amp and 30-amp and why it's important. KOA is capable of both the best, and the worst... my last 2 experiences at a KOA were the latter. We would not stay here again. We camped at Cornwall / Charlottetown KOA in a Travel Trailer. The campground has had several upgrades since we were last here- office area, laundry, washroom and beach access and signage. This time we had an electric and water site overlooking the water. Owner very committed and very personable. Washroom near our site was excellent, very roomy showers with lots of shelves, just redone it looks like. The owners have decorated many trees along the trail used for hayrides with stuffed animals, just for the kids. Did not use the pool but area around it looks new and it was popular on the warmest day. Campground is well off the road down a long path so no traffic noise at all and the view across the West River is great. We camped at Cornwall / Charlottetown KOA in a Motorhome. Very close to all things in Charlottetown. We had a premium pull thru on the river and the site & view were simply great. Everything worked great and if you have kids, this park is made for them. The swimming pool is olympic sized and the inflated bounce pad had kids on it all day long. We enjoyed the tranquil views, the well stocked store & office/game area and watching the tides. You can dig for clams right in front of the campsites on the river. Well worth the few bucks extra. Very convenient to Charlottetown and you can get to the north shore sites like Green Gables & North Rustico in 1/2 hour or so. We were a bit disenchanted with how crowded and touristy PEI was but this KOA was nice to come home to! Only criticism would be the very small number of bathroom facilities for a park this size. We camped at Cornwall / Charlottetown KOA in a Motorhome. Excellent KOA; we had a waterfront lot; lots of room, easy to navigate although the entrance by the office is a little tight. Sites are grass but they keep them nicely mowed. 15 minutes to Charlottetown. Great staff. Would definitely stay here again. We camped at Cornwall / Charlottetown KOA in a Fifth Wheel. Campground is big rig friendly. 30 and 50 amp sites with or without sewer and on the river. Gravel sites and roads. Okay place to stay. We camped at Cornwall / Charlottetown KOA in a Motorhome. Stayed at this park for 3 nights in a Deluxe pull-through site. This site was level with a gravel base and long enough to accommodate our 38 ft trailer and truck. This was a full service site with the exception of cable. I would recommend if staying here to book a pull-through site by the river as the view is well worth the extra few dollars and the sites are spaced more than the back-in lots that are at the back of the park without a view. This is an exceptionally clean campground and the owners and staff are very friendly and accommodating. 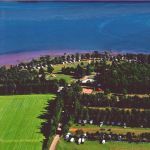 This park is 10 minutes from Charlottetown, approximately 25 minutes from Cavendish Beach and 25 minutes from the Confederation Bridge. Fresh lobster was for sale on the parking lot of the Esso which is 5 minutes from the park for $7.00 a lb at this date. The only small point that could be a improved is the size of the dog park, as it is small but will do and is very clean and grassed. We would definitely stay here again and would recommend this park as a good stop while exploring Prince Edward Island. We camped at Cornwall / Charlottetown KOA in a Fifth Wheel. Price is in CAD and reflects KOA discount. This is a very family-oriented camp. We have no kids, so on a long weekend, we found it a tad noisy, however, we weren't really spending time at the campground. Great facilities and close to Charlottetown. KOA only asks the length of your camper but I think they need to start asking total length of vehicle and trailer as many cars are parked on the roadside. We camped at Cornwall / Charlottetown KOA in a Travel Trailer. This was our first stay at a KOA. The sites were a good size and level. Easy set up for us first timers. The washrooms were updated and clean. Staff very helpful and friendly. Would definitely stay here again. We camped at Cornwall / Charlottetown KOA in a Fifth Wheel. If you don't mind driving about an hour north to North Rustic there is a restaurant called The Blue Mussel Cafe at the end of the boardwalk. Great food and service. Only 15 min. away from Charlottetown. If your a fish and chips person then Brit'S fish and chips in Charlottetown has the best with huge portions. If you want some local history and some site seeing then ride the Hippopotabus which takes you around downtown and then out into the harbour. Large spacious park with many activities for kids. Our site had a gorgeous waterview. There is a large laundry room, best I've seen in a RV park. The wifi was extremely fast right from the rig and everywhere in the park. The staff here is better than the best. They make every effort to make sure all your needs are met. We camped at Cornwall / Charlottetown KOA in a Fifth Wheel. Centrally located on PEI to explore east or west. CAN$ 51 per night for a 3-way site that offered quality services. Wi-fi was great except for busy weekend. Bell stick worked then. Dry firewood. Our pull-thru site overlooked the River and tidal beach. Roadway was a little eroded in the non paved areas and some water puddles in some roadways. Very kid friendly with many amenities for them to enjoy. Good location to explore and not far from Charlottetown. Pet friendly. Would stay again. We camped at Cornwall / Charlottetown KOA in a Fifth Wheel. Great family park located on the banks of the West River. Lots of family activities, friendly & helpful staff. Book "Well" in advance as the water front sites can be reserved a year in advance. Central to all of PEI and only 15 minutes from downtown Charlottetown. We camped at Cornwall / Charlottetown KOA in a Motorhome. Avoid the tourist restaurants etc. on the waterfront and downtown ... poor quality and high prices! Since we were here last summer they have made improvements to one washroom, completely redone the other and relocated the laundry room to a more convenient location. There are lots of trees at the edge of the section C that we stayed in. The WIFI was perfect. The manager is very friendly and accommodating. We did not have a waterfront spot but it a short walk to the beach and water. We camped at Cornwall / Charlottetown KOA in a Motorhome. The 'Cows' store in Charlottetown is a must as is the Festival Theatre and Gahan's restaurant. This park is a bit tight for our 36' MH with tow, so we ended up with a long tour through narrow, dirt roads to reach our assigned section. We backed into a level, grass site between rows of nice evergreen trees that give a bit of privacy, but it was very narrow and short, with barely enough room to extend the slides on both sides of our coach, and parking for the car across the field. We connected to the convenient water and electric hookups, but didn't bother with the sewer. The WiFi was spotty, and when we inquired about it the manager was not very helpful, claiming it was due to our computer configuration. We knew this was not the case, however, when half the campers left the following Sunday morning and the WiFi improved remarkably--though it still cycled in and out pretty frequently. The laundry facilities were large, clean and well priced. We did not use the bathrooms. The staff at this park seemed oddly abrupt and indifferent, which is very unusual compared to other parks we've visited in the Maritimes. Overall, we felt the price was high for the amenities and services offered by this park. We camped at Cornwall / Charlottetown KOA in a Motorhome. If you don't mind driving about an hour north to North Rustic there is a restaurant called The Blue Mussel Cafe at the end of the boardwalk. Great food and service. Only 15 min. away from Charlottetown. If your a fish and chips person then Brit'S fish and chips in Charlottetown has the best with huge portions. If you want some local history and some site seeing then ride the Hippopotabus which takes you around downtown and then out into the harbour. Are you affiliated with Cornwall / Charlottetown KOA ?